You are so much more than you can possibly imagine. I often forget this. I let everyday events get me down. So many times I think that I just can't do it. That I'm not brave enough, strong enough, or smart enough. Then I think back on all of the things that I thought I couldn't do in my past and I realize how many of those things I accomplished. So today I am making a commitment to say I am brave, I am strong, I am smart. I hope you will too, and then join me tonight when I will post Women Speak. We will delve into this topic more. I would add, You are a survivor. I have survived things I did not think I could ever survive. I agree that that we need courage, strength and wisdom to survive in this world. Thanks for your reminder that we are indeed stronger than we know. 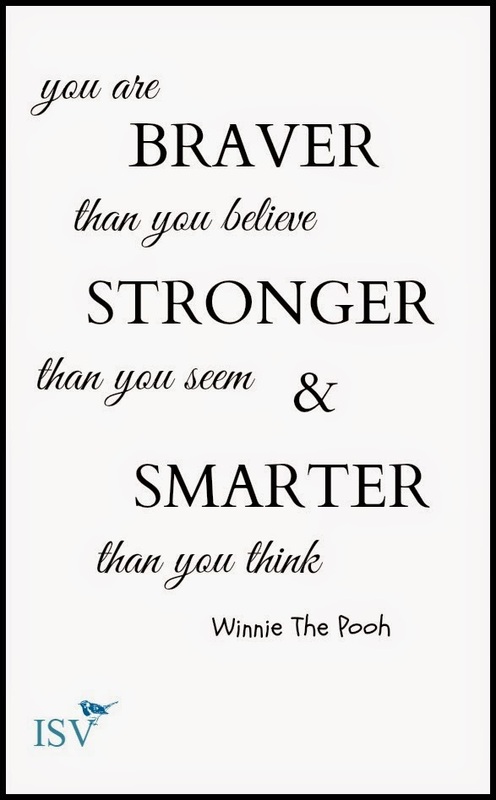 I enjoy your little snippets of inspiration and Winnie the pooh too! The wisdom of Pooh. Always relevant. Never dated.